A slump of 2.4 percent in global price in the trading session last night in New York sent the price of gold in Vietnam down VND1 million a tael (1.2 ounces) over the previous day on September 29, however, the metal recovered VND600,000 per tael later before going south again. Sacombank Jewelry Company bought gold at VND43.91 million and sold at VND44.49 million as of 10:56 am local time. Saigon Jewelry Company, the largest processor and gold trader in Vietnam, collected gold at VND44.02 million and sold at VND44.4 million in Ho Chi Minh City. In Hanoi, the company bought gold at VND44.02 million and sold at VND44.42 million. Hanoi-based Phu Quy Jewelry Company purchased SJC-brand gold at VND44.25 million and sold at VND44.7 million at the same time. Domestically, gold fetched around VND3.8-4 million a tael higher than global price. On foreign currency market, the dollar exchange rate was unchanged as of the previous day. Dollars continued to be bought at VND21,230 and sold at VND21,270 on free market in Hanoi. Internationally, gold plummeted as concerns that European leaders continued to get behindhand in pulling a specific solution to soothe the region’s sovereign-debt crisis hurt equities and commodities, strengthening the appeal of the US currency as an alternative asset. Gold for immediate delivery plunged $40 an ounce, or 2.4 percent, to close at $1,610.7 an ounce on the Comex in New York. In Asia, the metal weakly rebounded this morning. Spot gold restored $8.3 an ounce to trade at $1,619 an ounce at 11 am Vietnamese time. Earlier, the metal sank to below $1,600 an ounce. 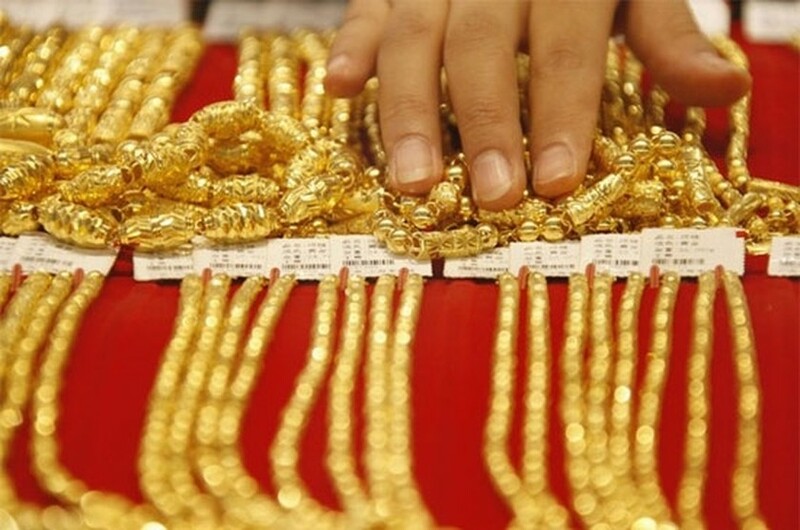 Gold was backed by buying demand of Asian jewelers, especially India’s, as a drop in prices from record will fuel demand during the festival season in the country. The euro exchange rate against the US dollar stood at $1.36 a euro in Tokyo this morning.